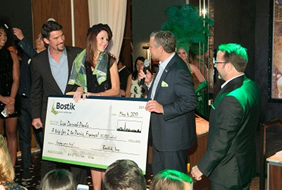 At Design ‘N Gather, the much-heralded, annual global tile mosaic design competition created by Artaic – Innovative Mosaic and sponsored by Bostik, the contest’s Grand Prize Winning Project was made public at a lavish and exclusive VIP event hosted at Hyde Bellagio in Las Vegas on May 4th. L to R: Ted Acworth of Artaic; Competition Winner Lisa Darroh-Pouls, Pouls Hospitality Design; Mike Jenkins and Scott Banda of Bostik. 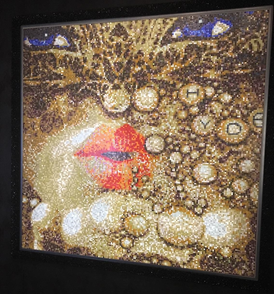 The walls of the Selfie Studio are clad with Crossville’s Laminam thin porcelain tile panels, which were installed using Bostik’s Bosti-Set, a premium adhesive and sound reduction membrane. Bosti-Set is a proprietary, new-to-world technology specifically created for installation of thin porcelain tile panels that was recently launched at Coverings. And, the flooring selected for this one-of-a-kind venue was “The Allways Collection,” an exquisite “wood-look” porcelain tile in the color “Bench” from Bedrosians Tile & Stone. The studio served as a showcase for over 9 Bostik installation innovations for commercial construction. For more information on the DNG in general, please click here.